Commuting is a nightmare whichever city you live in, and whichever country you live in it seems. We hear so much about “this city is the most congested in the world” and “traffic here is the worst in the world” and in many cases both of these statements are severe exaggerations. That isn’t to say that traffic doesn’t exist either, and two of the worst countries to commute in are France and England. Both are major countries, not just on a European scale, but globally. The two capital cities, Paris and London, are notoriously treacherous at the best of times with cars and buses whizzing everywhere and there just never seems to be a period of the day where you can make real progress with your journey, hence both cities having such famous public transport with the Metro and Underground services helping to get traffic off the roads. While both are very good ways at reducing the number of cars on the roads, they don’t solve the problem. There is still the inevitable bumper-to-bumper queuing at rush hour both to and from work, and in London you get charged for the privilege! One of the methods brought in by the UK authorities in an attempt to reduce the number of cars on the road was to bring in the congestion charge, a daily payment which allows drivers to move through the city. Effectively, you get charged to sit in a queue and arrive at work stressed and out of pocket. But there is a way around paying the congestion charge in London, and it is a method used by many in Paris and other major French cities such as Lyon and Marseille, and that is to use a motorbike or scooter. If you use a motorcycle in London, you are exempt from paying the congestion charge, so if you’re a keen biker, you get the best of both worlds – riding your beloved motorbike and not paying to do so! (Except the rather excessive price of fuel of course). As anyone who either lives in or has visited Paris, Lyon and Marseille knows, you can barely go anywhere without hearing the sound of a horn or a moped driving by. This is because car drivers there are becoming frustrated at sitting in traffic while motorcyclists drive freely between the traffic and in dedicated motorcycle lanes which are springing up in attempts to improve safety for two-wheeled riders of the human and petrol powered varieties. 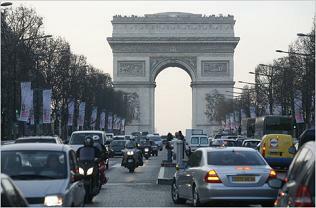 If you’ve not been fortunate to visit France, then you must have seen images of vehicles queuing up along the Champs Elysees and right around l’Arc de Triomphe, often four or five abreast. Why risk almost inevitable damage to your car sitting in that traffic when you could travel much more easily and weave between the queuing traffic on your motorbike? Other cities in the United Kingdom, such as Manchester and Birmingham, who both claim to be “the second city”, also struggle with traffic congestion, particularly at rush hour, and their way of resolving the traffic is to segregate it. As mentioned previously, many cities are installing dedicated motorbike and cycle lanes, making it much safer for commuters and this is something that many bikers are simply falling in love with. The number of bikers on the road in the two cities is on the rise as riders take the opportunity to combine travelling through the congested cities easily and getting to ride at the same time. So if you’re a motorcycle fanatic, why leave it locked up in the garage only to sit in a queue of traffic on your way to and from work, or relying on the public transport systems running to schedule – which they regularly don’t – when you could get out on your motorbike. We all love bikes. The freedom they offer and the experience associated with all the power between your legs and testing the handling to the limit – you just don’t get that in a car. Leave your car in the garage, take the bike instead! Have fun! Amusez-vous! This article was written by Chris White. A motorcycle enthusiast and experienced writer currently working on behalf of uShip – the experts in courier, house removal and man with a van services. Yes, it has been great being able to filter through traffic on a bike when cars are stationary. But the French interior minister, who does not seem to understand motorcycles, has decided that the practice must stop. Filtering is illegal! 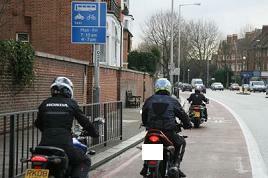 Motorcycles must queue with the rest of the traffic. Senseless nonsense, of course and one of the things that “Motardes en Collere” (Angry Motorcyclists) are demonstrating about. aticle in “le monde” today…..
I’ve just discovered this website and I’ve immediately fallen in love with it! I live in Italy and now I know that motorcyclists are facing problems even in UK. But guys, you’re really ahead of us italian people. I can’t believe you are really reserving lanes to bikers! I’ve been saying this for years! But in Italy they’re doing the opposite! They ban motorbikes from certain roads (ex: mountain roads), there are no parking spaces for us and people just leave their bikes on sidewalks; a couple of years ago they also tried to ban us from using our motorbikes during the wintertime and many other nasty things… Of course our guardrails kill motorbikers, but no one really cares here. By the way, lane filtering is illegal here, too, and vehicles under 150cc are not allowed on highways and other fast roads. We all need to stick together globally, because we are actually facing the same mistreatments worldwide!